The British Indian Ocean Territory, or Chagos Islands, consists of 6 atolls making up the Chagos archipelago. 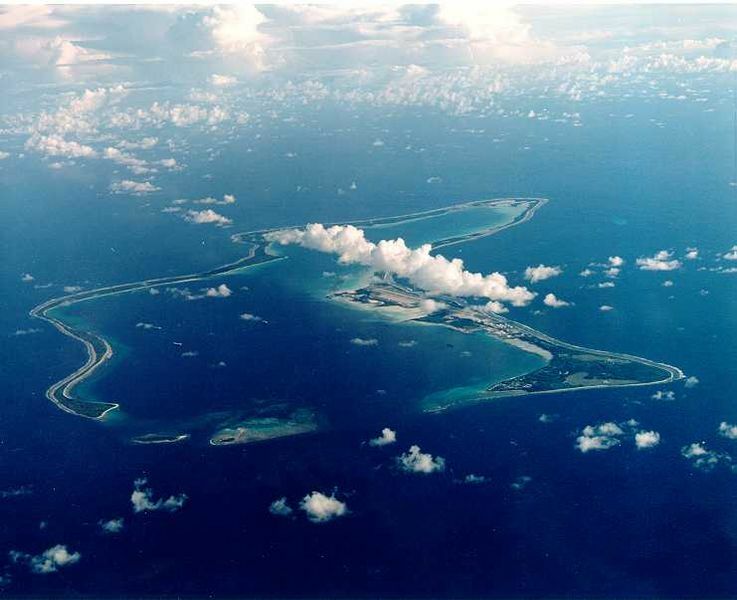 The largest island is Diego Garcia, home to a joint UK/US military base. Originally the islands where colonised by the French, however, they where seized by the British in 1810, and formally ceded over by the French with the signing of the Treaty of Paris. The territory was split in 1965, with the Seychelles now being administered separately. This was to allow the construction of military bases for the benefit of the UK and US. In 1976, the islands of Aldabra, Faruquar, and Desroches where returned to the Seychelles as the Seychelles gained its independence from Britain. The base was very important to Britain, as the US had promised a lot of cash in rent, as well as a big discount in selling the Polaris missile to Britain which would then become the backbone of Britain's nuclear deterrent. Before the base could actually be constructed, the island of Diego Garcia needed to be cleared. The British government then bought out the plantations, and forcibly resettled the Chagossians off the island, to the Seychelles, or Mauritius. Ever since then, they have fought for the right to return. The base itself is on British territory, and as such, has a British garrison at all times, as well as long range patrol craft. However, the base itself houses a massive US military complex for many of its branches of the military. Currently, Mauritius claims the territory, a claim that the British do not recognise. However, they have agreed to cede the territory over once its military use has finished. The Seychelles have also launched a territorial claim covering some of the islands in the archipelago. There is no Governor for the territory, since there is no native population. However, it is governed by a commissioner who is entitled to make laws for the territory under the territory's constitution of 2004. Part of this is that the US has to ask permission for using the territory for any offensive military action. The islands themselves where declared to be an area of environmental importance, with the British government banning fishing, and any other commercial activity in the seas around the territory, making the largest marine reserve in the world. 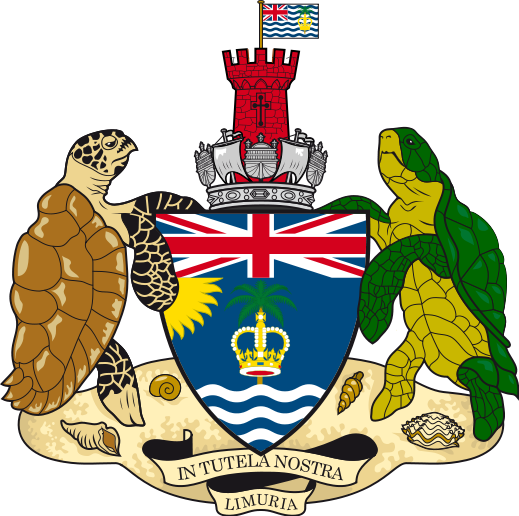 The coat of arms for the territory consists of a central shield emblazoned with a palm tree and the crown of Edward, set above 3 wavy lines, representing the ocean. The Union Jack is placed on the top of the shield. The supporters are two sea turtles. A Hawksbill, and a green turtle. The crest is a naval crown, through which rises a red tower topped with the territory's flag. The flag itself is another unique ensign. It is based on the standard British ensign, featuring the Union Jack in the upper hoist, and in the hoist, features the palm tree and crown taken from the territory's coat of arms. The flag is also not one solid colour, featuring a series of white and blue wavy lines taken from the coat of arms. 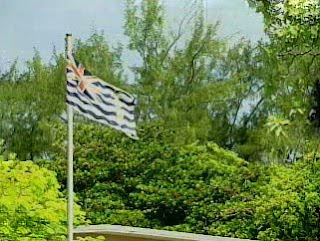 This flag was awarded to the territory in 1990, on the 25th anniversary of the BIOT.